49. Redding P. WILCOXEN.8,1,28 Immigrated to Lamar, Missouri.1,28 Resided in Lamar, Missouri.1 Redding P. died on 8 Dec 18?? in Lamar, Missouri.28 Buried in old Salem cemetery.28 Alias/AKA: Redding P. WILLCOXEN28 He was the namesake of his maternal grandfather, Redding Putman, thus his middle initial "P" probably stood for "Putman." Died in Lamar, Mo., Dec. 8, leaving his widow and a large family of children. The remains were brought to his old home in Liverpool tp. Funeral services were held at Salem church at 11 a.m. Thursday, with burial in old Salem cemetery. The services were conducted by Rev. Dr. B.Y. George of Elmwood in the presence of a large assemblage of Mr. Willcoxen's relatives and neighbors. Mr. Willcoxen was born on the old home farm, Aug. 29, 1838, a son to Elijah Calloway Willcoxen and Prudence Putman-Willcoxen, both of Kentucky, and they come to Liverpool tp. in 1830. 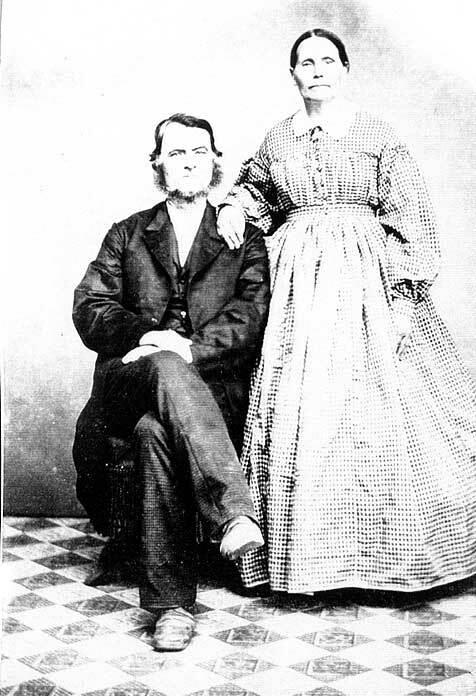 Redding was married May 8, 1862, to Miss Amanda Stout, who died at the age of 31, leaving four children -- Lee (who died about 1-1/2 years ago), Anna, (Mrs. Ney Willcoxen), Andrew J. and Noah C. Dec. 22, 1873, he was again married, this time to Miss Lucinda, daughter to James Morgan. To them were born eight children -- Mrs. Viola Berry, Wm. Wade, Redding Q., Jesse D., Mrs. Melinda Wilson, James Oliver, Bert, Jerry -- all living. On his first marriage Redding settled upon his father's old homestead, and on the death of the latter bought the farm of 219 acres, on which had been built a noble brick mansion, and here he continued to reside until his removal to Missouri some four years ago. Deceased was a sober, industrious and strictly honorable and generous man in all his dealings. He was ever high-mined, standing for the best things in public and social life. He was generous in his support of churches, temperance, good schools. He was the ideal husband, father, neighbor and citizen, an honor to the ancient and revered Willcoxen and Calloway names ñ worthy descendants of Daniel Boone and the Calloways of Kentucky. And Redding P. Willcoxen's whole life from childhood to his death reflected honor upon his famous, heroic ancestors. And so has passed away another lifelong friend of this paper and its editor. With his beloved we shall miss his courtly visits and the long, long friendship from childhood that bordered close on love. And may it be renewed in the Better Land. 1543 Shadrach C. Faw, b. 9 Aug., 1860; d. in childhood. 1546 Arabella Faw, b. 29 Nov., 1866; Alfus Ray. No children. 1551 James Walter Faw, b. 9 Aug., 1878; m. Luinda Leach. No children. 1966 Andrew L Shields, d. bef. 1879. He, in duration of residence is one of the oldest farmers of Fulton County, as well as one of the most successful and substantial, is located on Sect. 10, Liverpool Twp. He was born hear Canton, this county, Nov. 26, 1836, and is a son of Andrew J. and Margaret (RED) Shields. Robert SHIELDS, the father of Andrew, was a native of Tennessee, migrating from that state to Indiana and thence to Fulton Co., where he settled near Canton. There he was successfully engaged in farming for many years, and finally became a resident of Canton itself, where he died. His first wife, Naomi (LITTLE), who accompanied him from Indiana, died at a very early period on the farm on which he originally settled. His second wife was Mrs. BROWN, who moved with him into Canton, where she also died. Martha, widow of Wesley PITTMAN, and then of Alfred WEAVER. Andrew J. who is engaged in farming in Buckheart Twp. Naomi, widow of Henry FISHER, of Urbana, IL. Margaret, widow of Boone WILLCOXEN, who resides in Lewistown. Annie, b. July 6, 1866, who married Wiley RAY, and is the mother of Ethel, Wiley A, George, Clifford, Hazel M., Sylvia, Jesse E., Clugston, and, an infant. George L., who is a member of the parental household. Charles G., b. Oct. 4, 1880, a farmer in Liverpool Twp., who married Mary PRESTON, and has two children: Herman and Ross. Mr. Shields is a Democrat.He has creditably discharged the duties of School Director and has been a steadfast advocate of the interest of the public school system. He is a man of most upright character and correct life, never using tobacco or liquor in any shape, and in the community where he has lived so long, is greatly respected and regarded as one of its most useful and exemplary members. He is successfully pursuing the vocation of a farmer and stock-raiser in Fulton Co., IL, and is located on Sect. 35, Lewistown Twp., where he cultivates 110 acres of exceptionally productive land. Della, wife of William SNIDER, living in Buckheart Twp. Ina, wife of Charles SNIDER, of Dunfermline. In politics Mr. Shields is an adherent of the Democratic Party, but is liberal in his views. He has creditably filled the office ot Road Commissioner of his township. Fraternally he is affiliated with the K. of P. As a farmer and as a man and citizen he is ranked among the representative characters in the community of which he is a member. James M. first married Andrea SHIELDS. On 12 Apr 1870 when James M. was 22, he second married Isabel "Belle" FORD,9 daughter of John FORD & Ruth KIMBERLIN, in Fulton County, Ilinois.9 Isabel was born on 2 Oct 1853 in Clark Co., Indiana.9 Isabel "Belle" died in Fulton County, Ilinois on 11 Mar 1937; she was 83.9 Alias/AKA: Lucinda FORD. Among the leading farmers of Liverpool Twp., Fulton County, one of the most prominent isthe well known citizen whose name furnished the caption of this biographical record. He was born in Liverpool Twp., Mar 26, 1848, a son of Elijah C. and Prudence (PUTMAN) Willcoxen. Elijah C. was a son of Captain Elijah Willcoxen, whose career is portrayed in another portion of this volume. Prudence PUTMAN was the daughter of Redding PUTMAN who was a soldier of the Black Hawk War, and is long since deceased. of whose life is contained in this work. Douglas, a farmer in Liverpool Twp. The father of this family departed this life in 1872, and the mother passed away in 1883. Both were prominent and highly respected members of the community. He and his wife were members of the Baptist Church. In politics he was a Democrat, and he filled various township offices. The subject of this sketch, James M. Willcoxen, was reared on a farm in Sect. 8, Liverpool Twp., near the place where he was born. He remained under the parental roof until he reached the age of twenty-two years, when he moved to his present farm on Sect. 9, Liverpool twp. Besides this property of 100 acres, he is the owner of another 200 acres on which he is successfully engaged in general farming and raising a good grade of stock of all kinds. Utta, wife of Andrew SHIELDS, a farmer in Buckheart Twp. The parents of this family were members of the Christian Church. The father departed this life Jun 10, 1894, and the mother passed away in January 1901. In politics, Mr. Willcoxen supports the Democratic party, and he and his worthy wife are members of the Christian Church. Mr. Willcoxen is a man of excellent qualities of the head and heart and no member of the community is more highly esteemed or exercises a more wholesome influence in behalf of the public welfare. 55. Prudence WILCOXEN.1 Born on 17 Jun 1851. She went to the state of Washington.1 Prudence died in Centralia, Washington on 30 Apr 1925; she was 73. Buried in Satsop Cemetery, Satsop, Washington. On 16 Dec 18675 in Fulton Co., Illinois5 when Prudence was 16, she married John Alexander RAY,5,20 son of William RAY & Juliann FAW. John Alexander was born on 5 Jan 1845 in Ashe Co., North Carolina. John Alexander died in Centralia, Washington on 30 Apr 1925; he was 80. Buried in Satsop Cemetery, Satsop, Washington. 202 vii. Thomas Franklin "Frank"
57. Douglas WILCOXEN.1 Alias/AKA: Stephen Douglas Wilcoxen.